Apple is on a roll with its new audio product releases. 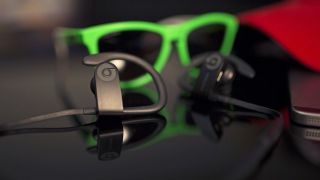 Rumors this week, as well as a leaked image, suggest that Apple is set to launch the Powerbeats Pro. They're a truly wireless version of its Powerbeats earphones, which could arrive as soon as next month. The Beats Powerbeats 3 (pictured above) are already wireless. But, according to reports from CNET, Apple is working on a true wireless version. This means it'll likely be getting rid of the connecting cord and the in-line remote, giving the Powerbeats an AirPod-style makeover. These rumors have had a recent credibility boost thanks to an image (pictured below) and animation hidden within the code of Apple's latest mobile operating system update, iOS 12.2. The leaked details, first discovered by 9to5Mac, also suggest that the new pair of truly wireless buds will be called the Powerbeats Pro, which certainly makes sense alongside the current Powerbeats line-up. The new AirPods competitor looks similar to the Powerbeats 3, minus the cable connecting up the two buds. Compared to the one-size-fits-all AirPods, the Powerbeats Pro design is sportier, with adjustable ear clips and interchangeable ear tips. What is it? A pair of truly wireless Beats headphones, which might be called the Powerbeats Pro. Truly wireless means the cord is gone and so is the inline remote – a pair of Beats that look like Airpods, essentially. When is it out? There's been no official word yet, but reports suggest it could be as soon as April 2019. What will it cost? We don't know. But the Powerbeats 3 were $199.95 (£169.95) at launch, so expect a higher price tag. Apple's rumored, truly wireless Beats headphones haven't been officially announced yet, which makes guessing at a release date tricky. However, the leaked details from 9to5Mac, which revealed images, the name of the new buds (the Powerbeats Pro) and more suggest they might be released as soon as April 2019. It's also hard to speculate about price until we know all the details. But right now, Apple sells the Powerbeats 3 for $199 (£169.95). However, they're a more conventional design and don't come with what we're hoping is a charging case. That means the Pro version may cost a premium and arrive with a much higher price tag. If the leaked images spotted by 9to5Mac are the real deal, the new AirPods competitor has the same look as the Powerbeats 3. The big difference is, as truly wireless buds, the Powerbeats Pro have got no cord connecting them together. Instead, they've got a sportier design with adjustable clips and interchangeable tips. This workout-friendly design could be a good option for those who want a secure fit that'll work well with the Apple Watch, not just the iPhone. It'll also be a good option for those who have always wanted a black version of Apple's AirPods, which currently only come in white. The Powerbeats Pro earphones may also include an H1 chip and offer support for Siri, just like the latest version of the AirPods. Charging case: We're hoping to find out that the case that appears in the leaked images of the new Powerbeats Pro earphones is also a charging case, which would be handy for juicing up your buds on-the-move. Extra points if the case itself also supports wireless power. Workout-friendly: The Powerbeats range has been a popular alternative to AirPods due to the more workout-friendly designs – there are clips to help each earbud stay in place. In comparison, the AirPods just aren't cut out for intense, sweaty workouts. We're hoping the new Pro version will be even more secure and gym-friendly than previous versions. Lengthy battery life: With rumors that the new Powerbeats Pro buds contain an H1 chip it looks likely they'll have a battery boost in comparison to the Powerbeats 3. If they don't, let's hope that case charges them up so they can compete with others on the market. If you're interested in what else Apple may have in the pipeline, check out our round-up of all the Apple HomePod 2 rumors, news and updates.